I have this amazing friend at work named Pamela. She makes me laugh on a regular basis, is super down-to-earth, and is an all-around good person. (The business world needs more of these types of people!) I thought she needed a little mosaic in her workspace, so this mosaic business card holder “magically” appeared on her desk! 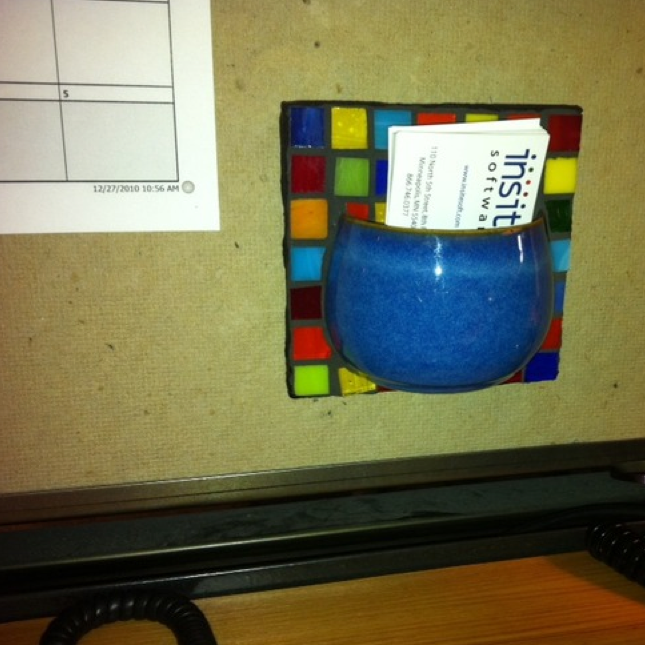 She sent me this picture of the piece “in action.” Thanks for the picture, Pamela! This piece reminds me that art isn’t always super snooty or high-brow. Sometimes it’s simply about adding a little beauty to the objects we use daily. Adding a little color to the daily grind, if you will. Add color wherever you need it. This entry was posted in Adopted Art! and tagged Adopted Art!. Bookmark the permalink.